Named after a Ween song, Captain Fantasy is the second Saison released by Half Acre in the last few weeks. This is the brewery’s second collaboration with Short’s Brewing Company from Bellaire, Michigan (the first being their Freedom of ’78 Pure Guava IPA from earlier this year). 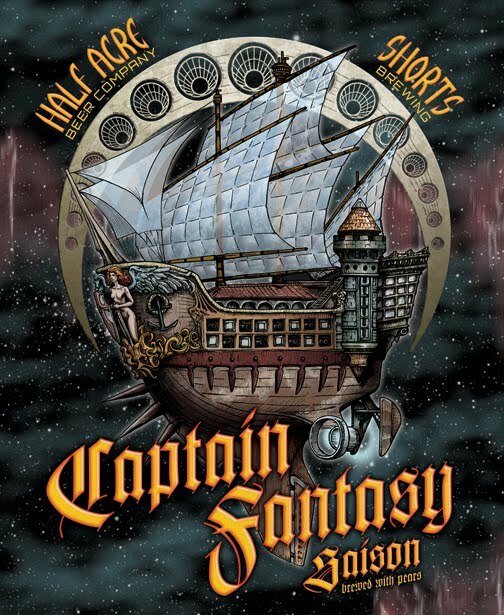 Captain Fantasy is quite a bit different from the previous Dripping Saison. This one was brewed with Sorachi Ace hops as well as pear puree, which is definitely an interesting combination. Upon first tasting, I couldn’t help but be overwhelmed with the pears. Quite frankly, I have never tasted a beer like this. The pear puree really stands out and gives this a very sweet taste. There is a little bit of spiciness, and the hops push their way in and take over after the initial fruit blast. The finish is a tad bitter, but not overtly so. It’s definitely a unique brew. All things considered, Captain Fantasy is a solid, refreshing summer beer. I didn’t like this one quite as much as Dripping Saison, but I will give it bonus points for being something unlike anything else I have ever had. Half Acre’s collaborations with Short’s have led to some fun experiments and I hope they continue to work together. – Captain Fantasy is available in growlers as well as 22 oz. bombers at the brewery.